What did buyers think of that product, campaign or launch you spent so many countless hours working on? Is your brand meeting consumer expectations? How do you conduct better audience or customer research before or after these key business efforts? Tough questions that need answers. You’re not alone in that battle. 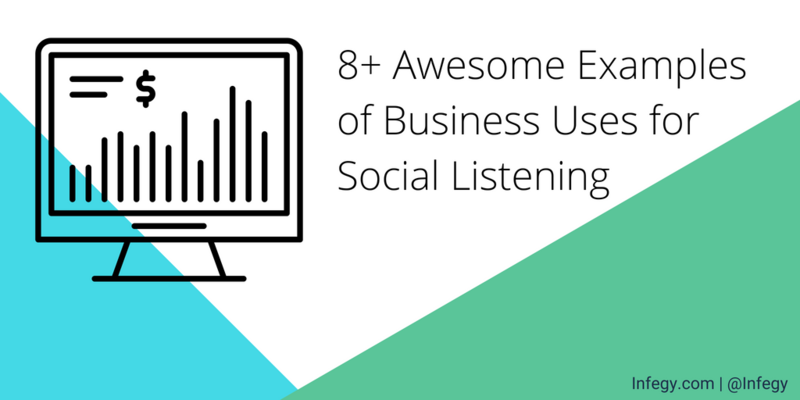 Many business teams have found success in discovering these insights using social listening. Listening offers actionable, yet often-missed insights for marketing teams, advertisers, market researchers, strategists and analysts. Members of these specific teams related to consumer research have all experienced the various capabilities of social listening tools and successfully implemented the data to improve their businesses. Teams from brands like BMW, or firms such as IRI and Droga5 have utilized social intelligence to inform their (or their clients’) strategies, make modifications to their products or services, or make key business decisions. Let’s take a look at how some of these organizations have had profound success at researching and implementing the data collected using social intelligence and listening. A goal that commonly causes a headache for medication companies is figuring out how they can better help their customers with their ailments. In this case, Tylenol wanted to identify sources of pain and frustration from people who suffer from migraines. What they discovered using social listening research was that there was a surprisingly high number of people complaining about various hobbies that required heavy eye focus. There was a high conversation volume taking place on “knitting” websites. They recognized that many of the posts were mentioning the strain knitting puts on the eyes was causing migraines and headaches. From this, Tylenol was able to dynamically shift marketing and SEO strategies to take advantage of this insight. This resulted in an increase in visits to website and increased visibility of brand in an underserved market by establishing further authority for people who suffer from migraines. In this instance, the dynamic social intelligence platforms allow for identifying new audiences that the brand had no idea existed. Shoemaker brand TOMS Shoes used social listening data to uncover a fantastic nugget that led to a big time sales generator. During their research, they discovered a high index of conversations around-- to their surprise-- My Little Pony. This means that people who were interested in or discussing TOMS were also highly interested in My Little Pony. Acting quickly, TOMS created a brand new “My Little Pony” themed shoe. The new product sold out within 48 hours. Samsung sells more smartphones globally than any other phone maker. One challenging task they have is keeping track of the launch events of their new products all over the world. They needed important information about trends to maximize these launch events, answering questions like: What locations are generating the most buzz around our new phones? How is conversation volume impacted around the launch of each device? Which devices drive more or less conversation? By using social intelligence, they tracked these global launches in real-time to gain an understanding of how successful they were and what buyers thought of the product at each of these events. Monitoring online conversations and measuring key trends, they got instant insight into sales success and customer service product issues and were able to compare to previous product launches and improve upon future events. With the rise in awareness around the concern of high sodium intake, fast food customers have shown some hesitance around some foods. Wendy’s wanted to find a way keep the favorability toward their french fries up. Wendy’s utilized social intelligence to conduct audience research leading to brainstorming around alternative marketing strategies, ingredients, product offerings and labeling. Through this audience research, they discovered “Sea Salt”, is talked about much more positively than salt or sodium. From there, they started adding Sea Salt into the marketing and advertising around their fries. They were able to capitalize on a more positive health associations with sea salt, and it helped improve their french fry sales. This speaks to the versatility and intuitiveness of this consumer research data. Here, sentiment analysis and linguistics led to new discoveries about consumers that had a direct impact on their customer base. 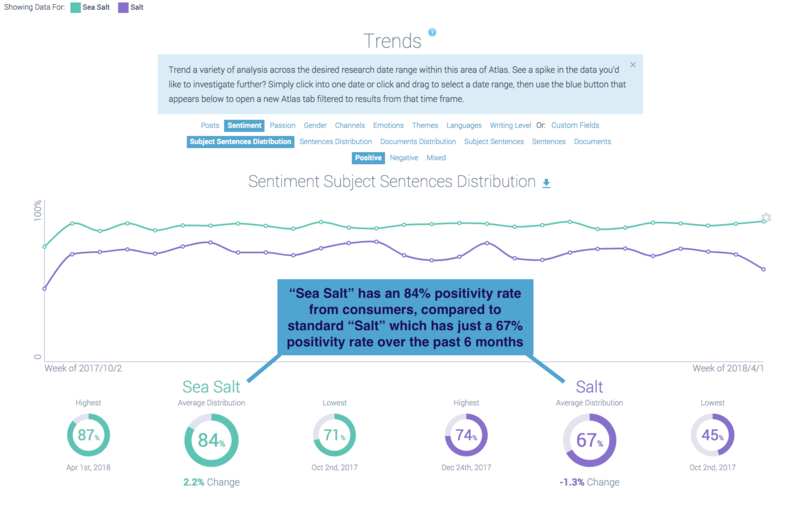 Check out the sentiment analysis of salt in the last six months. “Sea Salt” has an 84% positivity from consumers, while regular ole “Salt” has just a 67% positivity rate. We have a full report on the quick-service restaurant industry using social intelligence to understand QSR customer behaviors, brand favorability and buying trends. Download it here. A renown international retail and grocery brand was thrust into this situation when they became aware that a major publication was going to release information regarding illegal actions taken by a senior executive. In less than a week, they used social intelligence to research the potential reactions from their customers and identify and implement a solution. They were able to quickly assess the negative fallout, report to C-level, develop strategies and messaging as well as identify influencers to support response plan as events unfolded. Thanks to listening technology, they were able to quickly leap into action, developing and implementing a solution and mitigate negative fallout around the crisis situation. Social listening platforms give you 24/7 access to real-time conversations and allow you to quickly analyze what audiences are saying and develop a crisis management strategy. A leading market research firm has utilized social listening from Infegy to discover problems and new opportunities for their clients and help it guide new strategies for those clients. They helped a well-known caffeinated energy shot beverage brand identify the brands and products they were losing market share to like iced coffee, traditional energy drinks such as Red Bull and energy juice beverages like Bai. By using the intelligent listening platform’s robust research and analytics, they were able to paint a better picture of the competitive landscape and identify new opportunities within their market. This technology is useful for research firms to discover and understand important trends and offer powerful solutions for their clients. Quick service restaurant Arby’s had a novel approach to understanding consumer sentiment around their campaigns and product launches. They developed a strategy that involved analyzing audiences each time they ran a new commercial or released a new product or limited-time offer. They asked (and answered) questions such as: Does share of voice or conversation buzz increase when they release new TV campaigns? What was the feedback or sentiment around these campaigns? When they launched a new sandwich item in test markets, they researched what people were saying online to gain an understanding of customer responses to various marketing and product efforts. One awesome insight? They found that their curly fries got people talking online. They responded by offering free curly fries with new sandwiches to increase sales and ultimately increase the online chatter about those products, which helped them successfully roll out those products to a national market. If you’re a luxury car brand like BMW, you’re probably highly interested in which vehicle features drivers like most. They measured sentiment and passion levels year over year to understand how consumers felt with their new features. After comparing each year's information they found they had a hit with their new laser-guided headlights, which had a high conversation volume and passion levels. From researching past years’ data, they realized the excitement wasn’t as high in the LED-powered headlamps in previous models. Without the listening platform, they may have missed the enthusiasm around the laser headlight feature. In this case, the social listening research revealed that people were most impressed by the new laser-guided headlights. These brands and agencies have had remarkable success at solving problems, researching and understanding their customers and audiences, studying generations such as millennials, finding out consumer pain points and interests and discovering eye-opening information about their market. What surprising insights can you learn about your brand, business or client?